Take an almost stock Mellotron M400, get the heads azimuthed, and replace a knackered set of tapes...including shipping to/from the UK...start the process on May 6...and get it done before the concert on May 12! On the first day they get the 'tron and send out the head block and tape frame. For the next four they wait. On the sixth day they do most of the work. 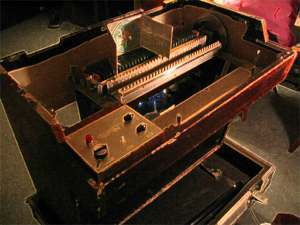 "Mellotron" is owned by Mellotron Archives. This web site is created by Ken Leonard. Photos by Ken except for a few from The Basement that came from Jimmy Moore Jr. Editorial by the dual team of James (Moto) and James (Jr.) Moore. John Medeski is a neat guy and can play like nobody's business. Check out Medeski, Martin, & Wood. Their current album is "End of the World Party (Just in Case)", and it has a lot of Mr. Medeski's Mellotron stylings. This web site is neither associated with nor endorsed by the people who bring you "Monster Anything." 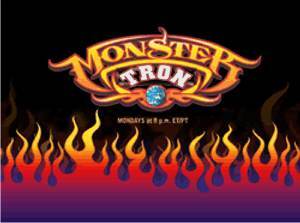 But the Monster shows are really fun. Forget Springer and just start watching The Discovery Channel. Warning: You might learn something. This web site is neither associated with nor endorsed by Acura, Moog, Wurlitzer, Hammond...or anyone else for that matter. But I'm appreciative of the link from Streetly Electronics. Ken Leonard and Jimmy Moore appear courtesy of absolutely no label records. Check out their first release "Improvised Waves: Mellotron and synthesizer improvisations" available now.